The wonderful Dawn from Dawn’s Inspirations is back and this time she is getting us in the Christmas spirit with this stunning project using the latest range of Build a Scene dies from Gemini. Keep reading to see how she created this stunning card! Sit back and enjoy this video, in which Dawn shows you this step by step! Take 2 sheets of double-sided Centura pearl and score in half and make 2 card bases that measure 5 7/8” x 5 7/8”. Keep the scraps as these will be used later. 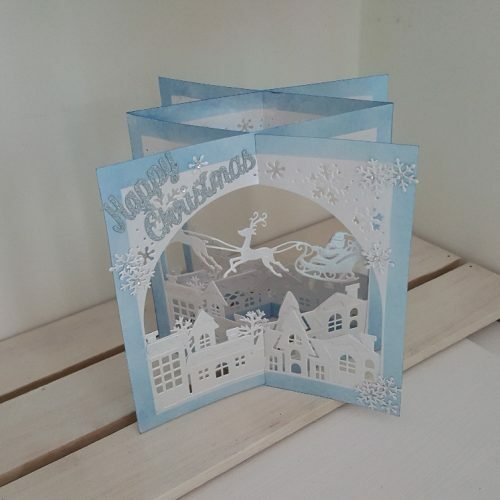 Using the main square die-cut out the centre of all 4 panels of your 2 cards. Now use the scraps from making your card bases to cut out your houses and Santa. Then stick the houses to the back of the card bases. Using low tack tape, mask off the boarder and ink the edges of each card front and the back. Die-cut your snowflakes and snow from the set and stick the snow elements on the front and back of each panel as this is going to be a 3D Project. You can also use your clear sparkle pen on the snow to make it shimmer. Now you need to insert one card to the opposite card and match up the slits and slot them together. Next do exactly the same on the other card. Just take your time and it will fold flat and concertina out. Now stick your Santa to the centrefolds. Also stick your snowflakes, sentiment and gems to add those finishing touches. Then your card is ready to sent and enjoy! 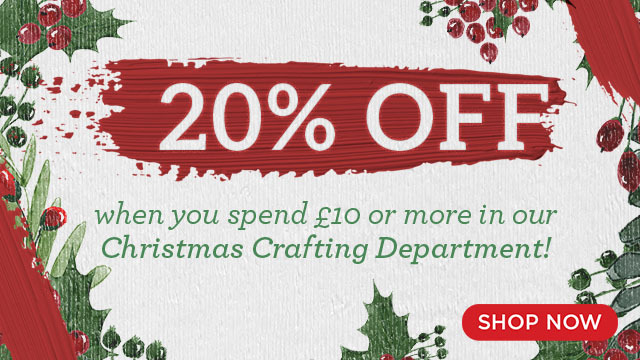 Don’t forget, we currently have 20% of our Christmas Crafting Department online! Shop now and save!